Hey Sugar Fix Fans! This week one of our patients with old silver fillings came in for Cerec replacement fillings. 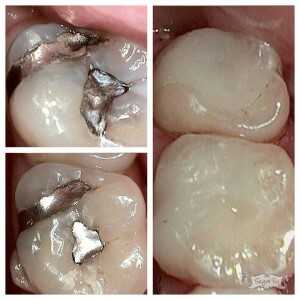 When silver fillings are old and worn, they start to leak bacteria in between the tooth and the filling. Even though teeth might not be in pain, the decay starts to extend further and further into the tooth. What does this mean for your teeth? More of the tooth is affected by the cavity and needs to be removed to leave healthy tooth structure. We always recommend getting these replaced at any sign of cracking or leakage. 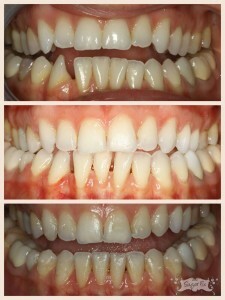 One of our patients is almost done with her Invisalign treatment! Her progress photos are below. These results were done in only 13 months of treatment and the results look amazing! The treatment consisted of 26 trays that were replaced every two weeks. Below, you can really see how the lower teeth properly aligned. This week we are all attending the Chicago Dental Society’s Midwinter Meeting. Check out our blog about the event! We love this event because there are really informative continuing education classes for us to attend. Plus there are vendors displaying the newest, state-of-the-art tools, equipment, and products.